Entertainment Weekly stated in their review of Fracture that if Ryan Gosling isn’t careful, he’s going to become a movie star. While that is as true as it was when he turned in his amazing Oscar nominated performance in Half Nelson, the man who may want to be careful in Fracture is Oscar winner Anthony Hopkins who has not only cornered the market on playing creepy killers but if he isn’t careful, he’s going to become typecast to the point that those roles are all that he’s offered. This being said, he plays the privileged sociopaths with superiority complexes better than most actors around and such is the case in Fracture which finds Hopkins at his devious and pretentious best as structural engineer Ted Crawford who at the start of the film follows his beautiful younger wife Jennifer (Embeth Davidtz) during her extramarital tryst with police Lieutenant Robert Nunallay (Billy Burke). Preferring murder to Jerry Springer styled theatrics, Crawford waits until his wife returns later in the evening and puts a bullet in her brain, later confessing to the crime when Nunally comes to the house only to find his lover shot. It seems like an open and shut case when it’s given to young, talented prosecutor Willy Beachum (Gosling) who is eager to leave his ninety-seven percent conviction rate earning minor paydays for the city of Los Angeles to become a climbing, wealthy attorney at an exclusive law firm where he’s offered a job. However, this last case proves to be quite upsetting when Crawford opts to serve as his own attorney, waiting for the chance to discredit Officer Nunally and challenge the hotshot Beachum whose weakness for success and self-centered tunnel vision may be his downfall. Although director Hoblit manages to pull the wool over our eyes numerous times with twists throughout, two of the major “surprises” are fairly easy to predict to audience members who have seen more than a couple of legal thrillers, including Hoblit’s masterpiece Primal Fear starring Richard Gere and Edward Norton. 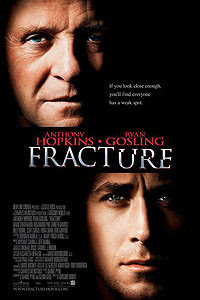 Still, like Fear, Fracture is memorable and worthwhile (at the time of this review it has an overwhelming fresh rating on Rotten Tomatoes) simply for lovers of great acting for the sheer pleasure to be derived in watching two superb talents go head to head.